American progressives can learn a lot from the new anti-cuts politics. If the Scottish National Party was a small anti-austerity party that had never before made a real dent in British politics and suddenly shot into contention—grabbing dozens of seats away from the traditional parties and elbowing its way into position as the third-largest party in new Parliament—the world would take notice. That move offers an important lesson for American progressives about going big in politics—especially anti-austerity politics. It is not just possible to run against the failed conservative policies of seeking to balance budgets with cuts to public services, attacks on public employees and their unions, and crude policies of privatization that redistribute wealth upward. It is necessary. “The vote yesterday was an overwhelming vote against continued austerity and that, the issue that we put at the top of the campaign, is the issue that we will seek to put at the top of the agenda in Westminster,” declared Sturgeon in interviews aired nationally Friday morning. That message resonated, with unprecedented force. The big story out of Britain’s 2015 parliamentary election had two parts. Part one was, of course, that Prime Minister David Cameron’s Conservative Party retained power. That’s the news that most Americans will get. But part two was at least as dramatic. The SNP—running on a fervent anti-austerity platform that rejected Cameron’s policies and promised to work with any progressive party seeking to unwind them—won 56 of Scotland’s 59 seats in the British Parliament. The divide between England and Scotland (as well as the divide between England and Wales) that was revealed by the results is stark. 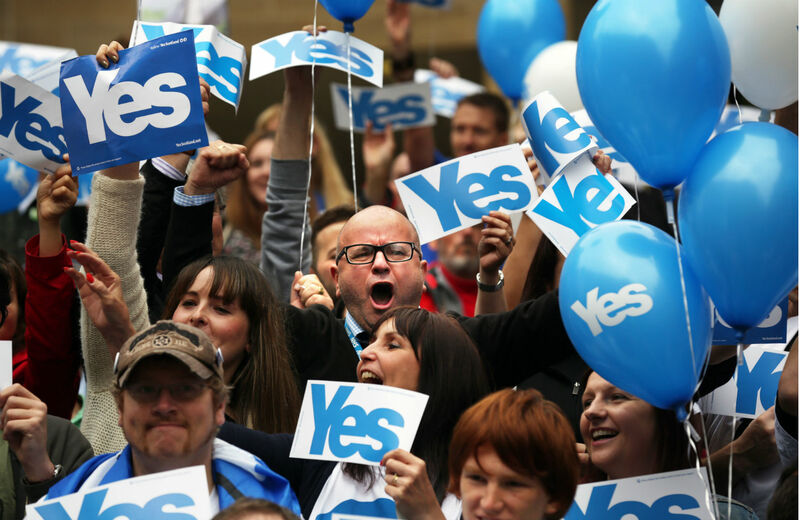 It points to ongoing tensions and the prospect that calls for Scottish independence—which the SNP backs and which won 45 percent of the vote in a dramatic referendum last year—will rise. But there was a subplot to the tale of the SNP success story. The UK’s traditional party of the left, the Labour Party, ran an unsteady (sometimes bold, sometimes cautious) campaign that failed to displace Cameron and the Tories from enough English seats and led to a severe setback across Labour’s traditional stronghold of Scotland. With Labour and the national third party, the Liberal Democrats, slipping badly, the SNP grabbed dozens of seats it had never held before. It did this, at least in part, by creating an excitement factor that translated into turnout. In England, the turnout Thursday was 65.8 percent, almost the same as the 65.5 percent rate in 2010. What changed? The 2014 Scottish independence referendum shifted a lot. It put fundamental issues of self-determination on the table, as well as the prospect of rejecting austerity with an exit strategy that, as the slogan suggested, would “End Tory Rule” forever. Independence did not win, but it reshaped thinking about political and economic possibilities. Historically, the SNP was seen as a narrowly nationalist party that focused first and foremost of independence for Scotland. It’s still pro-independence. But, in recent years, it has clearly identified as an anti-austerity party that has rejected cuts imposed not just by the current Tory government but the preceding Labour governments of Tony Blair and Gordon Brown. There was no mystery about the point of the independence referendum in 2014. Supporters of the referendum, led by the SNP and activist groups such as Scotland’s Radical Independence Campaign, sought not just a physical break but an economic break from Britain. There was no mystery about the point of the Scottish National Party campaign of 2015. The SNP decried austerity and ripped not just the Tories but the whole political process for failing to establish a humane and functional economics. When Labour and the SNP went head-to-head in Scotland, Labour lost more than 40 seats. Why the wipeout? Despite the fact that Labour was the opposition party to Cameron and his government, it fully aligned with the Tories to oppose the 2014 Scottish referendum. Labour leaders failed to recognize that the referendum vote was not merely raising the issue of independence but the issue of austerity. While Labour was not going to back independence, its shoulder-to-shoulder campaigning with Cameron’s Conservatives blurred the lines of distinction. The message of the SNP breakthrough, not just for Scotland, and not just for Britain, is that people are sick of the “cozy consensus.” And they are ready to vote for radical alternatives. Americans progressives can, and should, learn from the emerging anti-austerity politics that says, unequivocally, that the cuts must end and a new economy must emerge.